Pickles are cucumbers preserved in a solution of vinegar, salt, and other flavorings. They are typically fermented with naturally-occurring bacteria prior to vinegar preservation. While pickling technology has been known since ancient times, pickles are still a popular food, with over 5 million lb (2.27 million kg) consumed daily. Pickling of plant and animal foods is a relatively old method of food preservation. It is estimated that the first pickles were produced over 4,000 years ago using cucumbers native to India. The ancient Egyptians and Greeks both have written about the use of pickles for their nutritive value and healing power. Pickles were a common food during the time of the Roman Empire and they soon spread throughout Europe. In America, pickles have always been popular. The first travelers to America kept pickles in large supply because they were nutritious and did not spoil during the long journeys. It is interesting to note that Amerigo Vespucci, America's namesake, was also a pickle salesman. He was the main pickle supplier to many ships. The first large-scale commercial production of pickles did not take place until 1820, when Nicholas Appert began selling pickles in jars. Over the years, the pickle production process has become more automated, however the basic pickling methods have changed very little since the technology was first developed. While there are many different types of pickles, some characteristics are common to all. In general, pickled cucumbers are crisp vegetables, which can be described as having a strong, biting flavor caused by the vinegar in which they are stored. Different pickle manufacturers normally add spices to give their pickles a unique flavor. Dill-flavored pickles are perhaps the most common of all pickles. There are also sweet pickles, which are packed with added sugar. These are typically used for making relishes. Kosher pickles were pickles that were approved by the Jewish Orthodox Congregations of America, but the word kosher is now often used to describe any garlic flavored pickle. There are six basic types of ingredients used for pickle making. The main bulk food is the cucumber. The additional ingredients include acids, flavorings, colorants, preservatives, and stabilizers that make up the liquid, or liquor, in which the pickle is sold. Many of the ingredients are only available at certain times of the year, so steps have to be taken to use fresh materials. Undoubtedly, the most important ingredient in pickle manufacturing is the cucumber. Special seeds are used to produce cucumbers that are straight, thin skinned, have a predictable number of warts, and are properly sized. These characteristics are important for uniform pickle manufacturing. Technically, pickles can actually be made using all kinds of foods such as onions, peppers, olives, pears, peaches, and even fish and meat. These are usually referred to as pickled foods to indicate the type of processing required to make them. Acetic acid (vinegar) is the primary ingredient used in pickle manufacturing. After water, it makes up the bulk of the pickle liquor and contributes significantly to the flavor of the pickle giving it a sour taste. Additionally, it also has a preservative effect and is nontoxic. Vinegar is derived from naturally occurring sugars or starches through a two-step fermentation process. Starch is converted to sugar, which is then yeast fermented to form alcohol. The alcohol is exposed to an acetobacteria, which converts it to vinegar. Vinegar can be obtained from many sources and each one has a slightly different taste. Therefore, depending on its source, the vinegar can have a significant effect on the taste of the final pickle product. Other ingredients, which impact the final taste of the pickles, are added to the liquor. Sugar is used to provide a sweetness to offset the sour taste of the vinegar. It also helps to make pickles more plump and firm. Artificial sweeteners like aspartame and saccharine can be used for a similar effect without increasing the calories. Salt is added for flavor and it also has an added preservative effect. Pure granulated salt is typically used since it is devoid of anti-caking ingredients that could make the liquor cloudy. While vinegar, sugar, and salt make up the bulk of all pickle liquors, it is the various spices and herbs that differentiate between pickle types. Dill weed is the most common type of aromatic spice and is used to make all forms of dill pickles. Other aromatic spices include allspice, cassia, cinnamon, cloves, fennel, fenugreek, and nutmeg. For more potent pickles, hot spices such as capsicum, black pepper, ginger, and mustard are used. Herbs like basil, marjoram, mint tarragon, and thyme are also used to give pickles a unique taste. Flavorful vegetables including onions and garlic are often included in a pickle liquor. Typically, the pickle manufacturer has a standard spice mix made for each type of pickle they manufacture. Some additional ingredients may be added to ensure the pickles meet standards set by the manufacturer. In general, pickles do not require any colorants because their natural color is acceptable. However, to create a standardized product and overcome the effects of processes such as bleaching, manufacturers often add color. Two common types of colorants are turmeric caramel and cholorphyll. The caramel provides a slightly brown to yellow color and chlorophyll gives a green color. To inhibit color changes in pickles, sulfur dioxide is added. Firming agents such as lime and alum may also be added. These materials help make pickles crispier without significantly impacting the flavor. Surfactants such as polysorbate are also used to couple ingredients in the liquor solution. Making cucumber pickles can take up to 42 days depending on the manufacturer's recipe. Production involves four primary steps including harvesting, preservation, pasteurization, and final processing. The process is highly automated once the cucumbers are delivered to the processing plant. 1 Once harvested by field workers, cucumbers are put in large bins and transported to a receiving station. If the cucumbers are transported a long distance, refrigerated trucks are used. This helps to maintain the fresh appearance and flavor of the vegetable. At the receiving station, the cucumbers are poured out onto a conveyor where they are subjected to a cleaning process that removes the excess stems, blossoms, dirt, and other foreign matter. This step is important because trace amounts of bacteria on unwashed cucumbers can ruin the final pickle product. They are then moved to an inspection station where rotten vegetables are removed and the rest are separated by size. From here they are moved to a chiller and stored until they are ready to be used. During a storage period of about five weeks, the fermentation bacteria breakdown the sugars present in the vegetable and produce carbon dioxide. To prevent adverse effects from the carbon dioxide, the tanks are periodically degassed. Pickles made in this way have a shelf life of many months. advantage of a naturally-occurring bacteria that is present on the cucumbers or innoculate with a specifically desired bacteria. In either case, the bacteria are halophyllic, or salt tolerant. During the storage period of about five weeks, these bacteria breakdown the sugars present in the vegetable and produce carbon dioxide. To prevent adverse effects from the carbon dioxide, the tanks are periodically degassed. Pickles made in this way have a shelf life of many months. The other two methods of preservation do not require a fermentation step. One method is by direct pasteurization. In this method, the cucumbers are bottled and then exposed to very high temperatures for a set amount of time. This has the effect of killing all of the natural bacteria that may is present. These sterilized cucumbers can then be further processed into pickles. This method of production results in pickles that have a shelf life of only a few months. The third method is by refrigeration and acidification. These pickles depend on the cold temperature and vinegar solution to prevent spoilage. While they are much faster to manufacture, they have a much shorter shelf life. 3 After the pickles have adequately fermented, the salt solution is drained. The pickles are then immersed in water to remove all of the salt they may have acquired during the cure. From this point, the pickles are moved along a conveyor to a slicing machine which cuts the pickles to the correct size depending on the type of product desired. They can be cut into slices, chips, or can even be diced. Attempts are made to maintain as clean an environment as possible for the pickles as contamination by microbes could result in an undesirable product. 4 After being cut, the pickles are typically placed in glass jars although cans, plastic bottles, and pouches have also been used. The packing machines are designed to deliver the correct amount of vegetable to each jar. The jars are moved along to a liquid filling machine, which fills them with the liquor. The pickle liquor consists of vinegar, salt, and other materials mentioned previously. This liquor is premixed in a large container prior to filling. To ensure an adequate distribution of spices, these are some-times filled into the jars before the liquor. From the filling machine, the jars are capped and moved along for pasteurization. 5 The problem of spoilage is evident throughout the pickle making process. Cucumbers can spoil during the brining process and even during packing if they are exposed to air for too long. For this reason the pickles are pasteurized. In order to pasteurize the pickles, they are typically exposed to high temperatures for an extended period of time. Depending on how long the pickles are heated, pasteurization can either kill off all of the acetic acid-tolerant organisms or inactivate all of the enzymes in the vegetable. In both cases, pasteurization increases the shelf life of the pickles. 6 Most pickles are vacuum packed which means the air is removed from the jar before it is sealed. This helps maintain the pickle taste and prevents contamination by microorganisms. In order to vacuum pack the pickles, air in the jar is replaced with steam just before the cap is sealed. When the steam cools and condenses, it creates a vacuum, reducing the amount of free oxygen present in the jar. The vacuum seal is responsible for the familiar pop that is heard when a jar of pickles is opened. 7 The jars are next moved along a convey-or to a labeling machine. Labels are automatically affixed and a freshness date is stamped on the jar. From here the jars are moved to automatic packing machines which put them in cardboard boxes. They are transferred to pallets and shipped out to the local retailers. Quality control is an important part of any food preparation process. It is particularly important in pickle making because poor quality control will result in an unpalatable product. The process begins in the field while the cucumbers are being harvested. Trained workers inspect the cucumbers for any signs of spoilage. If any spoiled cucumbers are found, they are discarded. Most manufacturers set specifications that the cucumbers must meet before use. During production, regular quality control measures include laboratory tests for the level of acid in the pickle liquor. This is done through a titration method using an automatic buret (test tube-like container). Other measurements that are taken on the final pickle liquor are pH, refractory sugar readings, and salt readings. Most of the methods for these tests are described by government regulations in publications by the United States Food and Drug Administration. Research focusing on improvements in pickle technology is being done by the various seed companies and universities. One of the primary areas of interest is the development of improved pickling cucumbers. Many university groups are using biotechnology and plant grafting techniques to produce cucumbers that are larger, more plentiful, and resistant to microbial and insect-born diseases. New fanring methods concentrating on obtaining a larger harvest with fewer plants are also being tested. In addition, pickle manufacturers are also coming up with new flavors of pickles by varying the composition of the liquor and using different fermentation organisms. Mabey, David. Perfect Pickle Book. Parkwest Publications, 1995. Macrae, R.. editor. Encyclopedia of Food Science, Food Technology and Nutrition. San Diego: Academic Press, 1993. Sudell, Helen. Country Pickles and Preserves: Gifts from Nature. Anness Publishing, 1997. 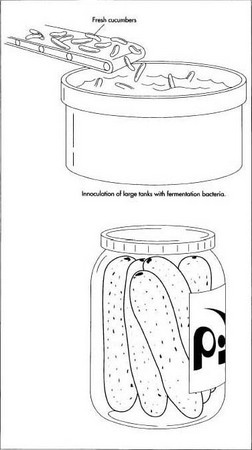 Thanks a lot for the informations on how to manufacture pickles. In making "refrigerator" pickles...what should PH reading be for optimum results?